Welcome to the Monache High School Library Media Center Website. This website provides detailed information to students, parents, and faculty members. The Library Media Center (LMC) currently has over 20,000 titles on the shelves to choose from. With the online book catalog one can search these titles 24/7. Our website provides up to date information on the Peer Tutoring Program, College Resources, Recommended Reading List, a detailed calendar of events and much more. We strive to create a safe and welcoming atmosphere, provide a place where students are free to explore the world around them through print and electronic media, inspire students to develop a love for reading, and be the place where all students can strive for and achieve success. The LMC is in the center of the campus and is the hub of our school. Hours may vary during finals exams and/or special schedule days. Visit the library for login password. 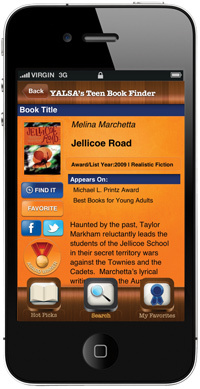 YALSA's Teen Book Finder is a free app to help teens, parents, librarians and library staff, educators, and anyone who loves YA literature access to the past three years' of YALSA's awards and lists on their smartphone.